Fortune Magazine was created as part of Henry Luce’s Time, Inc. publishing empire in February 1930, four months after the Stock market crash that started the Great Depression. It was created as an expanded and specialized publication drawn from the business section of Time magazine, written and designed with big executives and upper level managers in mind. The original prospectus stated that “business is the single common denominator of interest among the active leading citizens of the U.S . . . Fortune’s purpose is to reflect Industrial Life in ink and paper, and word and picture as the finest skyscraper reflects it in steel and architecture”. Fortune’s annual listing of the 500 leading corporations, “the Fortune 500”, as it is known, became an American institution, against which all other businesses are measured. Among its many innovative editorial approaches was to publish a standard feature article that examined different aspects of a single corporation, much like a biographical portrait. Henry Luce believed that all business was invested with a public interest, and so published Fortune with the idea of creating public awareness of corporate practices and activities—good, or bad. As the magazine developed and took shape, the subject matter started to encompass both commerce and culture- subjects such as a specific company, an entire industry, a wealthy or influential family, an American place of interest or a foreign country were covered by Fortune. 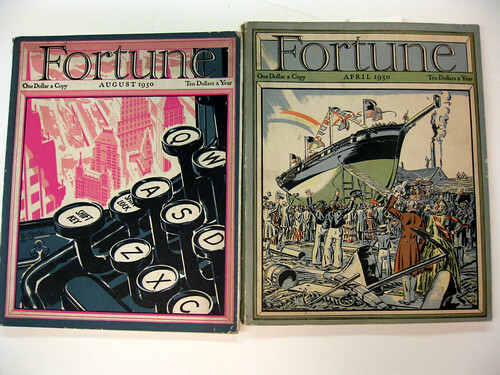 From the very beginning, Fortune was known for the quality of its artistic, advertising and editorial content. High quality printing on fine paper added to its character, along with excellent illustrations. 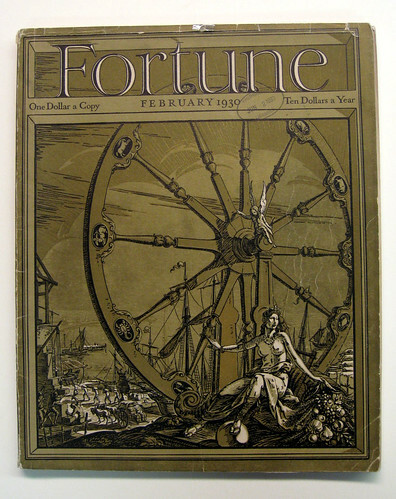 The large size format, rich color and textures of the cover art made Fortune an impressive an easily recognizable publication. Much of the magazine’s success was attributed to its beautiful covers, unusual for a magazine primarily concerned with business and social issues. Original artwork was commissioned from prominent artists who created some of the most innovative cover artwork of the times. Fortune artists illustrated the growth of 20th century industrialization with streamlined, modern graphic styles and layouts, as well as more rustic, traditional subjects with more conventional illustration styles. great to see this institution is still going strong!! Unbelievable information from a great institution. thank goodness for archived material..So glad this was published. this is good to know. and thank you for sharing your expertise with us.